Azure Backup announced general availability of Recovery Services vault, based on the Azure Resource Manager model, in May 2016. With Recovery Services vault, customers can backup Classic as well as Resource Manager virtual machines using custom defined backup policies. 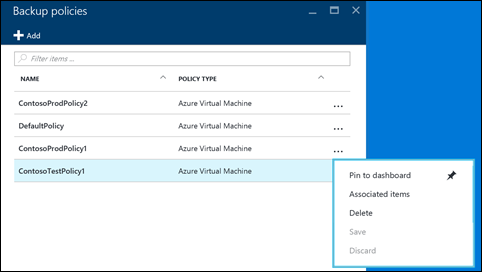 Today, we are adding the capability for our customers to manage backup policies and model them to meet their changing requirements from a single window, making Azure Backup an enterprise-level backup solution for Azure virtual machines. 1. Open a Recovery Services vault. Create a Recovery Services vault if one doesn’t exist. 2. From Settings Menu, click on Backup Policies to bring up policy management blade. 3. To edit policy or add more virtual machines to the policy, select a policy to bring up the detailed policy blade.